Dan apparently cheated on Jess before the MAFS finale and WHAT. The rumour that Dan cheated on Jess before the Married at First Sight finale aired. Just when we thought we’d been exposed to all the Jess and Dan drama we could handle, a bombshell has dropped about the Married At First Sight couple. Apparently, Dan cheated on Jess during a night out two months ago. Just for reference, that would’ve been after the show wrapped up filming. A woman named Hannah called into KIIS FM’s Kyle and Jackie O show on Wednesday morning and revealed she’d kissed the 35-year-old. 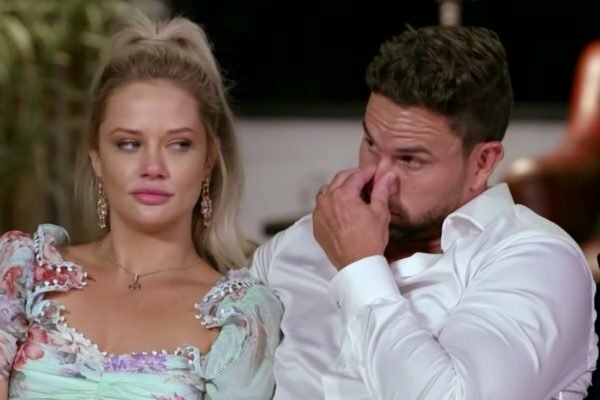 Dan and Jess had a huge fight after the MAFS finale. You can watch a glimpse here. Post continues after video. “Okay so I’ll read out the message,” radio host Jackie O said live on air. Hannah told the radio show she explained to Jess exactly what happened. She was under the impression, on the night, he wasn’t in a relationship because he made the first move. “He was trying to do that and I said no and then he literally kissed me,” she said. It was a tense end to the season for Dan and Jess. Dan has major trust issues surrounding Jess&apos;s &apos;flirting&apos; with another contestant. Image: Nine. On Monday night, however, we watched their relationship disintegrate before our eyes over Dan&apos;s distrust in Jess &apos;hitting on&apos; another contestant before him. He claimed she&apos;d told him when they first hooked up that she hadn&apos;t "tried it on with another guy." “She goes down with the lie, dies with the lie, and even on the [finale] tonight she didn’t admit it,” he said, during a fiery interview on Talking Married. "I&apos;ve got major trust issues," he said. "We&apos;re banging our heads against a wall. It creates so much negativity and toxicity in our relationship it really does," he added. Of course, we can&apos;t know for sure if the rumours about Dan cheating are true. But it certainly adds another level to all the drama.